[New for 2015] Ok, with the peanut butter and speculoos cookie cores reviews out of the way, it's time for the last one... I know, I know, some people get frustrated when we try stuff that we probably won't like, and we don't mean to frustrate, but sometimes the brand or the individual components in a flavor compel us to try things out of our comfort zone. Case in point, it's time for that burnt/bitter mocha funk. The call of the chocolate cookie core commands me to buy it! Without even thinking about it, i dug in to the mocha side first. 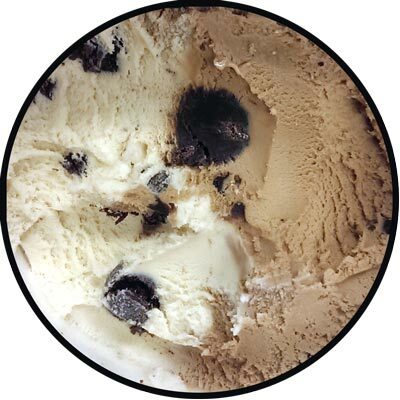 I was hoping for more of a middle ground flavor, but it basically tastes like regular coffee ice cream to me (well, B&J's caliber coffee ice cream anyway). I had hoped for a bit more chocolate and sweetness to it. The caramel side is mild again, pleasant, and well made, but mild and unremarkable. The chocolate cookie bits are soft and squishy, the chips are occasional, and neither put up much of a flavor fight against the mocha side. The core is fun ofcourse, but again, it's not as vicious as expected. These all feel like cookie cores and not cookie butter cores. I know, splitting hairs again, but it's my (fake) job to set your expectations at the right level. If anything, this flavor makes me wonder why they don't make mocha or coffee Oreos. (ok, technically they did already). Coffee lovers rejoice, this core is for you. Everyone else, be prepared for everything to play second fiddle to the mocha flavoring. The core is cool, there's no doubt about it, it's just not as balanced as I had hoped... the name is boom chocolatta, so I thought there'd be a bigger chocolate boom, I'm just literal like that. Note: I know I'm not the right person to review this so I'll have Nick chime in once he finally finds this one. I was just hoping my pint would have more mix-ins to deflect that coffee taste. 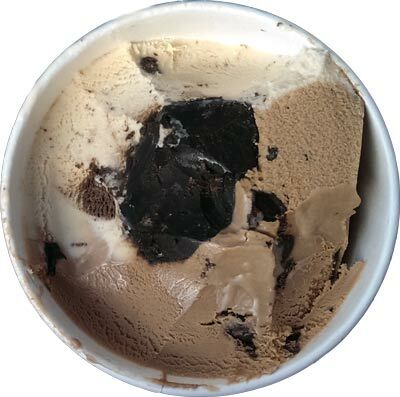 On Second Scoop: Whoa, the core's getting a little small here, but no matter. Is this a quality product? Yes. Will I have any trouble finishing it? No. Do I love it? No, but I do respect it. I just think you need to have some affection for coffee to be buying this more than once. More chips, more cocoa, either of these could have sealed a repurchase for me, but as is, it's a one-time novelty for me. 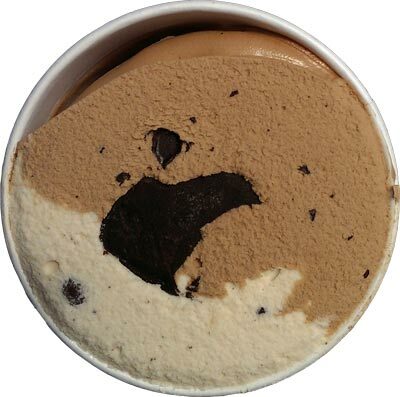 Note: In Europe, they replace the mocha and caramel base with a chocolate base, and they forego the chips. It's known as What-a-lotta Chocolate. I know it's simpler, but I would probably like it more. Where we're u able to find this pint? I love coffee and was looking forward to really tasting that in this pint. I'm disappointed the chocolate flavor isn't stronger, though. My main hope was that the core would be more like Dairy Queen's cookie crumble stuff in their ice cream cakes. B&J is in my backyard and yet, none of the new flavors are available yet. Gutted this is being marketed as a plain old chocolate flavour in the UK. We never get any good flavours! Was looking forward to trying a new coffee ice cream too as there are very few available here. I finally got to try this and was so disappointed! I think the cores just don't work for me. I'm not sure if Ben & Jerry's really care how customers feel about their product. Last year I went to my local Ben & Jerry's store and ordered an ice cream cake. It was really a good ice cream cake. So this year I did the same and ordered an ice cream cake again. What a huge disappointment. While the ice cream was good, the cake had the texture of stale bread and no flavor. Being for a birthday party, we were stuck eating the cake. Actually we just scraped the ice cream off and threw the rest away. I stopped in to let the store I bought it from know about it. They were clueless as to why the cake was not good. Of course I did not return the cake, so there was nothing they could do for me. They asked me if I would consider trying another cake. I told them that that is a lot of money to spend on something that we are no longer sure whether or not it will be good. I do need another ice cream cake for an upcoming birthday celebration, but I think I will go someplace else. I did go to the Ben & Jerry's web site and sent them a message, but they never did send a response. I actually really love this flavor. I love the core, and I love coffee, but didn't find the coffee notes in the mocha flavor to be too overpowering. My boyfriend isn't a huge fan of coffee flavor in his sweets, but he loved this flavor as well. I'm a girl who loves chunks of mix-ins in her ice cream, so I would've enjoyed more of them, but I didn't think the pint I had was lacking. 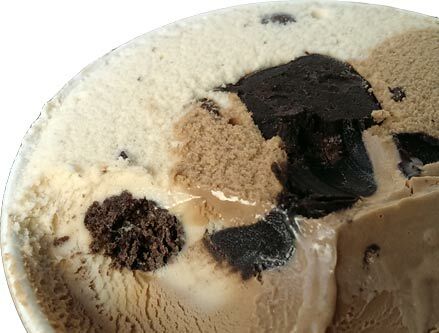 I enjoy the mocha and caramel ice cream flavors, especially once they've melted. Yum! 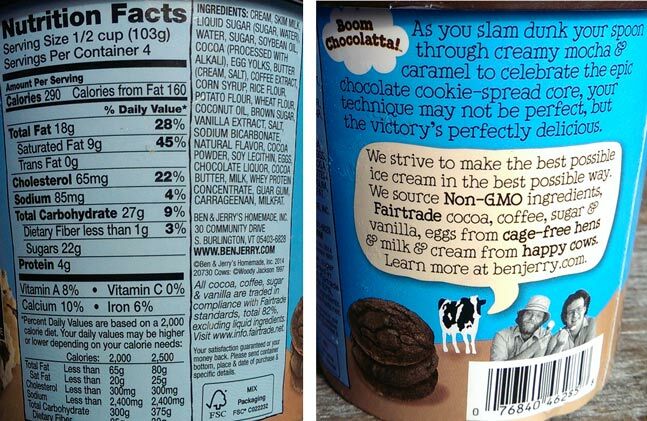 I would prefer an entire pint of both flavors without the cookie core. The core is just too dense and salty for my taste. My grandson is two years old,he has major milk allergies (any form of milk or related milk products). children with these types of allergies are so limited to so many foods and to find a treat that is dairy free is rare. children with food allergies should not have to pay double the price or not get the sale price. @Anon: as the dad of a boy who is allergic to nuts, dairy and eggs, I will agree that living with food allergies is very expensive. That said, it's not all Ben & Jerry's fault. The price goes up as it passes from supplier to distributor to grocery store, plus this new dairy-free line up has only been out for a few weeks. Nick ran in to a similar issue where all the dairy B&J's was on sale but not the new almond milk stuff. Chocolate Chip Cookie Dough, use to be the only Ben and Jerry's flavor I eat. Until I had THIS one and Spectacular Speculoos. Both of which are my favorite ice creams of all time, and I hope they never ever go away. I actually don't eat the mocha side, which I know is wasteful, but man the chocolate cookies, that core, and the light side (which tastes like a tres leches flavor to me) are just too perfect for me to stop buying. You can taste the dark dutch cocoa AND the brown sugar in their chocolate cookies! Why have Ben and Jerry's not made ice cream sandwiches with these cookies??? Anyhoo, rant over. Nice blog you got here. 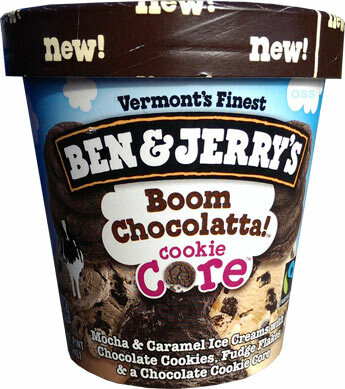 Well, of course the core is more like a cookie core and less like a cookie butter core. It SAYS that it's a cookie core and not a cookie butter core.